СК Паук > High-altitude work. Price > Industrial Chimney Inspection and Maintenance. Repair of brick and concrete pipes. 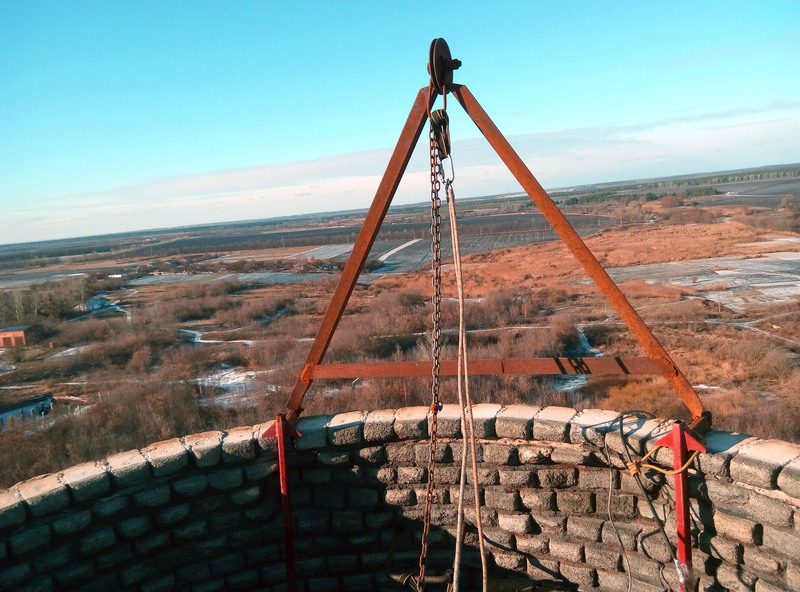 Maintenance of industrial chimneys is the repair of the barrel, retaining rings, service platforms, lightning rods, head, fittings, signal lighting, signal painting and other elements to maintain normal operation of the chimney. Maintenance and repair of brick pipes is the prevention of pipe destruction and regular maintenance of their correct operation. Brick pipes need to be repaired much more often than reinforced concrete counterparts, they are subject to the influence of bad weather conditions, a particularly vulnerable spot is the chimney head. To repair the tip, you need to remove the rows of destroyed bricks and put new ones to the proper level. Repair of the pipe itself involves the restoration of the brick channel. If there are fallen bricks, chips or cracks – you need to seal the damage zone with a special mixture. The most important element of a “healthy” pipe is the repaired chimney foundation. The presence of the slightest flaw can lead to collapse. Maintenance and repair of reinforced concrete pipes are the work of carrying out systematic operations to maintain the condition and structural integrity of reinforced concrete pipes. The iron fittings in the pipe frame are subject to corrosion, so if the anticorrosive treatment is ignored, the concrete layer may collapse. If the thickness of the destroyed section exceeds 3 cm, embedding is carried out on a metal grid in 2 or more layers. For better grip, cover the surface with concrete contact. The inner part of the pipe may need jointing and sealing of cracks. In case of complex damages, we produce a full plaster surface. The method of priming and painting depends on the location of the structure. The fastest application is with a high-pressure apparatus. If the pipe is within the residential area, painting is carried out using brushes and rollers, the device can not be used. The height of reinforced concrete pipes in an industrial enterprise can reach 350 meters, therefore, only professional industrial climbers should be involved in the work. In this case, you will avoid undue risk and be confident in the result. Filling is a method of concrete work in which the concrete mixture under pressure of compressed air is applied in layers to the surface. An effective way to increase the gas-tightness of the barrel tube and restore the lining. Apply the repair solution to the damaged surface, carefully filling all the pores. When shotcrete adhesion of the repair mixture with the surface is much higher than the adhesion with the manual method of application. We leave for measurement and calculate the cost for FREE! Call, we will be glad to cooperate. Send us an application with photos of the object in Viber to number	066-555-44-33 and we will immediately call you back. Repair of brick and reinforced concrete pipes. 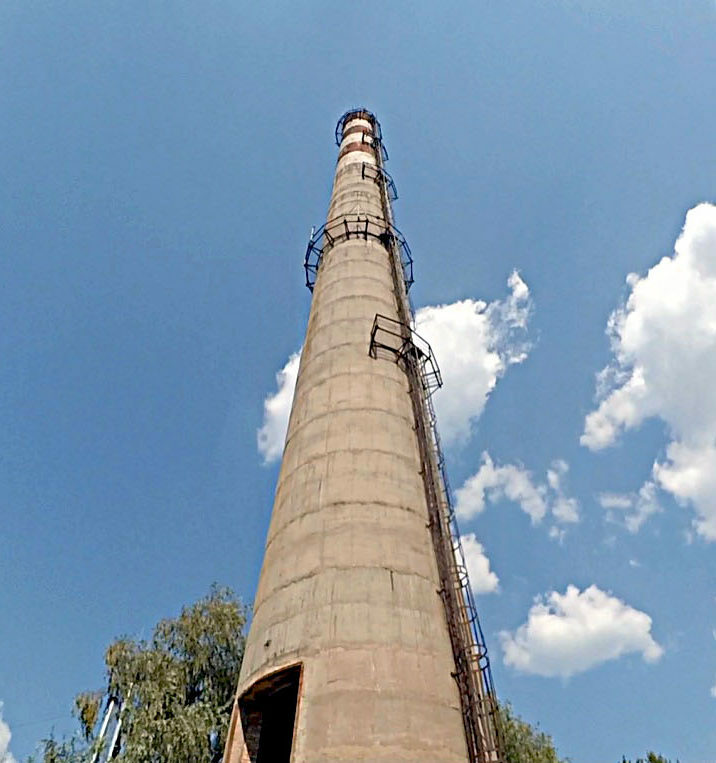 Maintenance of industrial chimneys.